Nashville, TN -- Dublin-based roots band, I Draw Slow will release their highly anticipated new album, Turn Your Face to the Sun on Compass Records April 21st. Their combination of infectious high-energy songs, exuberant performances and a passion for tradition come together on this album to create the band's most cohesive offering yet. Fronted by brother/sister songwriting team Dave (guitar/vocals) and Louise (vocals) Holden, I Draw Slow coaxes the past into the present with original tunes that draw from the best of Irish and American folk music. Nashville, TN -- Compass Records is proud to announce the signing of Dublin-based roots band, I Draw Slow. Their combination of compelling songwriting, exuberant live performances and passion for tradition make I Draw Slow a perfect fit for Compass Records, a label with a long history of working with Irish artists within their diverse roster of roots music. I Draw Slow coaxes the past into the present with original songs that draw from the best of Irish storytelling and American folk music. Asheville, NC -- Dublin roots band, I Draw Slow, has been garnering praise around the globe since the release of their 2012 album Redhills. 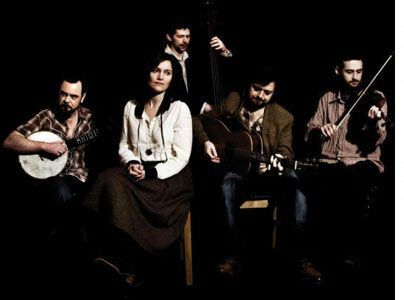 Now their latest release, White Wave Chapel (2014), is all the buzz at home and overseas with their unique sound, bringing together Irish tradition with modern Americana while staying rooted in the old-time style of Appalachia. Their impact abroad is redrawing the map for these Irish/Americana songwriters. They are happy to return Stateside this summer for a handful of shows in mid-July including Red Wing Roots Music Festival in Virginia, Tellus 360 in Lancaster, PA; Creative Alliance in Baltimore; World Cafe Live Upstairs in Philadelphia, and Grey Fox Bluegrass Festival in New York. Dublin roots band I Draw Slow release their second album July 8th with Pinecastle Records. White Wave Chapel is poised to continue where their last album, Redhills, left off. Redhills was a resounding success with American radio and fans that fell in love with the band during several U.S runs. The band recently toured the States in the spring, including a performance at the prestigious festival Merlefest. They will be back in October for another slate of shows. Nashville, TN -- Call it the “Irish Acoustic Music Invasion” if you would like to label it or simply call it good music from Ireland teaming up with some of the best acoustic artists in the United States as I Draw Slow brings their music to America this Fall for a two week tour that kicks off September 22nd at Jack of the Wood in Asheville, North Carolina. I Draw Slow brings their talents in songwriting and musicianship to a Fall Tour that will place them with many great artists in some of America’s top venues over a several weeks outing sharing the stage with some of the best in Americana and Roots Music. For I Draw Slow this will be their first time performing in the United States. The Tour is supported by and Pinecastle Records and Mountain Music Entertainment. Columbus, NC -- Irish bluegrass/folk artists I Draw Slow have released their critically acclaimed project, Redhills, on Pinecastle Records prior to their U.S. tour this fall. The band and Redhills have been featured on Irish television and reviewed by influential Irish music magazines and blogs and now the album has come to the U.S. Radio stations around the country are already playing their new album. I Draw Slow makes their way to America in the Fall of 2012 to support their upcoming Pinecastle Records release Redhills due out in late Summer. I Draw Slow is a five-piece acoustic roots band hailing from Ireland comprising vocals, guitar, fiddle, banjo and double bass. Holden siblings Dave (guitar) and Louise (vocals) have been writing together for two decades, starting on Dublin’s gigging circuit with Tabularasa. Columbus, NC May 15, 2012 - Pinecastle Records is pleased to announce that it has signed I Draw Slow. Their upcoming album Redhills will be released August 7th, 2012. Customers who pre-order Redhills from thePinecastle website will also receive a free digital copy (available here) delivered on the release date. In addition, customers will also receive the single "Goldmine" instantly after their purchase.